An interest-rate hike in time saves nine. Well, a couple, anyway. By tightening the screws by a quarter percentage point for the second time since June, the Reserve Bank of India (RBI) may have earned itself a fighting chance to stay pat for the rest of the calendar year. Ahead of Wednesday’s decision, short-term rates of 6.25% were barely keeping pace with core inflation at a four-year high of more than 6%. A bigger motivation to raise them sooner rather than later is expectation of even stronger inflationary pressures in the near future when the government starts procuring farmers’ crops at the higher prices it announced recently. To that, add last month’s $2 billion-a-year cut in the Goods and Services Tax (GST) on a plethora of consumer products — from washing machines to televisions and refrigerators — and the central bank’s monetary policy committee already had ample reason to move proactively to keep consumption demand from bubbling over into higher prices. The other worry is the dollar. 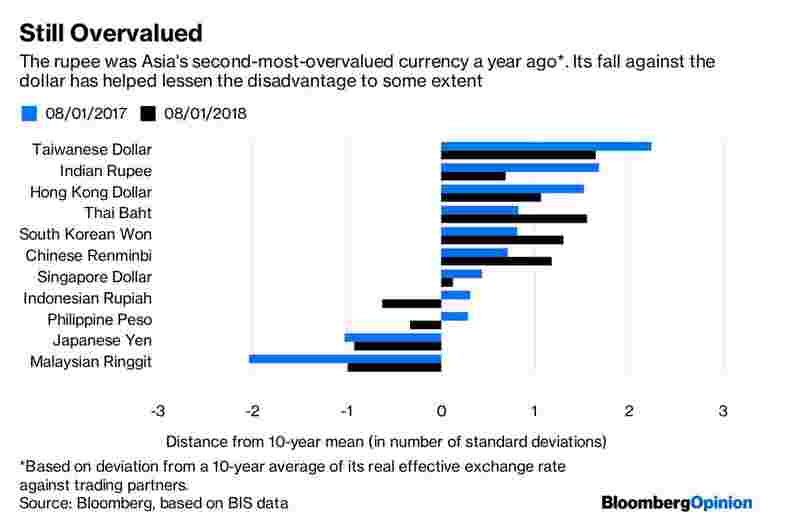 While letting an overvalued rupee weaken in line with the yuan may be a sensible strategy for India to regain competitiveness amid an escalating US-China trade war, any hint at this juncture that the RBI isn’t defending the home currency could spook global investors. The bond market is reeling under growing concerns around fiscal laxity, with global investors having already pulled out more than $6 billion so far this year. Big-ticket privatization deals, for instance of money-losing Air India Ltd., have been put on the back burner. There will be a popular clamour for cuts in petroleum taxes should pump prices rise again. An already worrisome current-account deficit could swell further for the fuel-importing nation if crude oil resumes its upward march. India’s capital-starved state-run banks are a big vulnerability for the sovereign. S&P Global Ratings doesn’t expect a recovery in Indian banks’ earnings until March 2020. External financial instability feeding into this domestic weakness could be a risky cocktail. It’s hard to say whether this rate increase will sacrifice growth. The State Bank of India’s advance indicator for manufacturing is already showing that momentum, which was starting to build up again after last year’s botched implementation of the goods and services tax, is waning. Unless capacity utilization continues apace for some more time, the much-awaited recovery in private investment will anyway be delayed. Higher interest rates could hurt mortgage demand — though that’s being kept alive by the government with liberal subsidies for affordable housing. 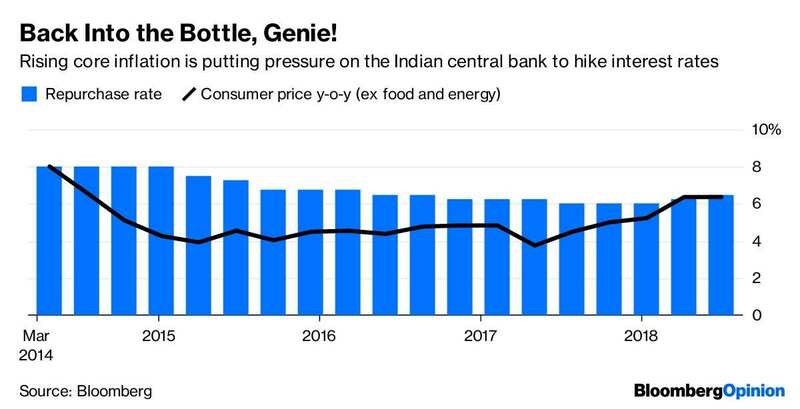 Since India has stopped collecting reliable jobs data, the three items that will face the most scrutiny on Prime Minister Narendra Modi’s economics scorecard in next year’s elections will be: pump prices for gasoline, inflation, and the rupee. Losing control of any or all of them would be a gaping wound. Even Modi should prefer a stitch in time.